What to look for when buying a soymilk machine? Infant and toddler formulas are usually made from cow’s milk, but many children have lactose intolerance or allergic to cow’s milk. Signs and symptoms that a child’s digestive system in unable to digest milk fat can include abdominal pain, vomiting, diarrhea, nausea and other symptoms. Because protein is needed by the body for growth, cow’s milk has to be replaced with a beverage that has similar nutritional values like soy milk. Soy milk will provide the nutritional needs of the human body without the difficulties encountered due to lactose intolerance or allergies. Soy milk is also the preferred beverage of vegetarians who do not consume meat and animal products. There are many health benefits and outstanding nutrition that come from soy milk and other soy products. They are low in fat, they have no cholesterol and they are very low in saturated fat, in addition to the protein and a greater variety of carbohydrates they provide. 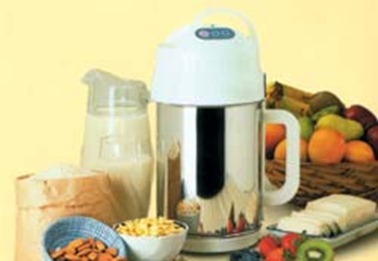 People use modern appliance and devices like soy milk makers to make their daily beverage. There are many soy milk makers to choose from and they have different features and characteristics. The modern devices have integrated technological advances to make their operation easy, convenient and user friendly. The new models are not just soymilk makers; they are almond milk makers, rice milk makers and can make porridges and soups from combinations of ingredients. When looking for a soy milk maker, consumers should look at its grinding technology and its filter. The new filter-less design makes the machine easy to clean and easy to use, without the hassle of cleaning up every time that makes soy milk making time consuming. That is why I highly recommend Soyapower Plus soy milk maker. Please see my detailed review here. Consumers should also compare features and power against the price. Some machines have integrated new advanced features but have made the unit much more expensive. A soy milk maker should be fully automatic and should start with one touch of the start button to make the user purr, very much like a driver does when his vehicle starts in one click. The machine should of course be versatile and durable with a long-time warranty, preferably for more than 5 years. Buyers also look at the size and relative capacity of the appliance they buy. There are soy milk makers with pre-programmed operations that can make milk from soybeans, seeds and grains or make soups and porridges combining various ingredients like beans, grains and seeds. Another manufacturer bonus that a buyer will look for in a soy milk maker is an easy to read user’s manual. A recipe book featuring soy milk as an ingredient is also a useful and consumer friendly bonus. A machine that is very useful and versatile is priceless for a busy homemaker. Again, that is why I think Soyapower Plus soy milk maker is the best on the market now. Other things a homeowner will look for in an ideal kitchen equipment is its quiet operation and energy consumption to save on electricity costs. It should not also emit too much heat, so the kitchen stays cool and not heated unnecessarily. One of the most important things to be considered when buying a soymilk machine is safety. There should be no risk of fire from overheating or from burning elements, the undersurface should not be slippery, so it will not slide from the countertop, the pitcher and its small elements should be properly in place when the machine is working with no danger of slipping or flying about the kitchen. 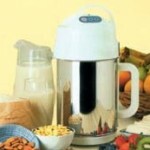 If you are interested, please check my previous article: Soyapower Plus soy milk maker review.